Dowling–Degos disease (OMIM: 179850) is a rare genodermatosis characterized by reticulate pigmentation of the flexures. This disease is inherited in an autosomal dominant pattern, with onset typically in early adulthood. The clinical presentation is with development of hyperpigmented, reticular macules on the face, trunk, axillae and groin. 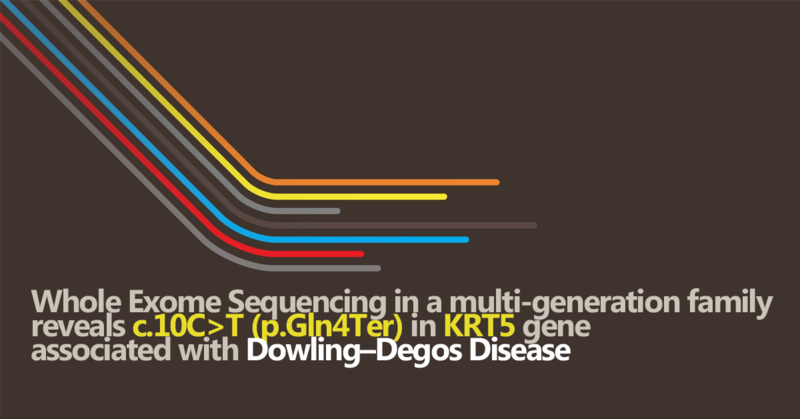 The mutations causing the disease are usually found in the keratin 5 (KRT5) gene and rarely in the protein O-fucosyl transferase 1 (POFUT1) and protein O-glucosyltransferase 1 (POGLUT1) genes. POGLUT1 and POFUT1 are components of the Notch signaling pathway, involved in the differentiation and migration of cells. Mutations in these genes affect the skin more than the hair. Only a few cases suffering from this disease have been described previously from India, as it is a rare disorder with an unknown population frequency. In the current report, we emphasize the utility of whole exome sequencing in the molecular characterization of the genetic defect, in a rare familial case of a reticular pigmentation disorder.